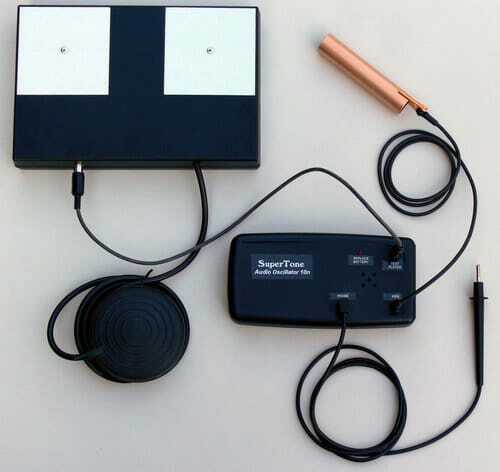 We are now offering the biofeedback audio oscillator developed by Dr. Hulda Clark: the Best Zapper SuperTone Syncrometer. The Professional SuperTone we manufacture and sell is the same as the syncrometer unit used and recommended by Dr. Hulda Clark, including the improved battery life and stabilized sound she enjoyed so much. Each unit has a 5 year parts and labor warranty. Dr. Clark asked for three units to test, and then wrote, “They did have the best sound I had ever heard, so to speak.” We test and calibrate each SuperTone Syncrometer by hand to the exact specifications developed by Dr. Clark. She suggested we call them the SuperTone, because of our superior sound clarity. We supplied many of these units to Dr. Clark and her patients at her Century Nutrition clinic. You can find a good introduction to the Syncrometer on pages 457 to 511 in “The Cure for All Diseases,” from www.amazon.com or New Century Press at 1-800-519-2465. These units require a solid commitment to master. Prepare to practice 1 to 2 hours per day for 3 months to become proficient. Dr. Clark recommends 6 months of practice before testing for others. We suggest that you first view the Syncrometer Basics training video and Syncrometer Science Laboratory Manual from New Century Press (1-800-519-2465) or from our Zapper Store. To obtain full benefit from the unit, you will need a range of test substances to use as references. You can make them up yourself as Dr. Clark describes on pages 462 to 511 in “The Cure for All Diseases,” or obtain them from www.DrClarkStore.com or the other sources listed in the back of the book.